Indoor smoking is an easy way to impart a lightly smoky flavor into foods, especially in the winter time when going outside seems daunting. Our preferred DIY method in the Crespo Organic Kitchen, when it comes to indoor smoking, is the wok method; we don’t use the wok for much else, but you can also use a deep and wide soup pan. We use a round-wire cake cooling rack set down inside the wok and use a regular lid which allows for the ingredients’ smoking to have ample room. This method works also with the big soup pan. This stove-top method offers us more creativity than an outdoor smoker. You can add spices, herbs, sugars and other smoking enhancers that would burn off way too quickly outdoors, thus allowing for more creative smoky flavors. We use dried Madagascar vanilla beans and alder wood chips (the fine ones) for the base of the smoking ingredients. We also added some cardamom, star-anise and cinnamon to accentuate the earthy essence of the alder. You will need 4 mango cheeks for this recipe. Using the HACK METHOD to cut the mango is the best method to extract the cheeks. A wok and tin foil are needed for the DIY smoker. Prepare the wok as instructed here, by covering with tin foil. Mix together the wood chips, cardamom, star anise, cinnamon and sugar. Scrape out one vanilla bean (set other bean aside for now) and place the vanilla paste into the alder sugar mix. Cut the scraped bean into small ½ inch pieces and also place with the alder, mix together. Place the alder mixture in the wok and place the wok on a burner. Set the round rack over the alder mix and turn the burner up to medium-high. The wok will take about 5 minutes total to heat up enough to begin to burn the items, the sugar will begin to burn first. 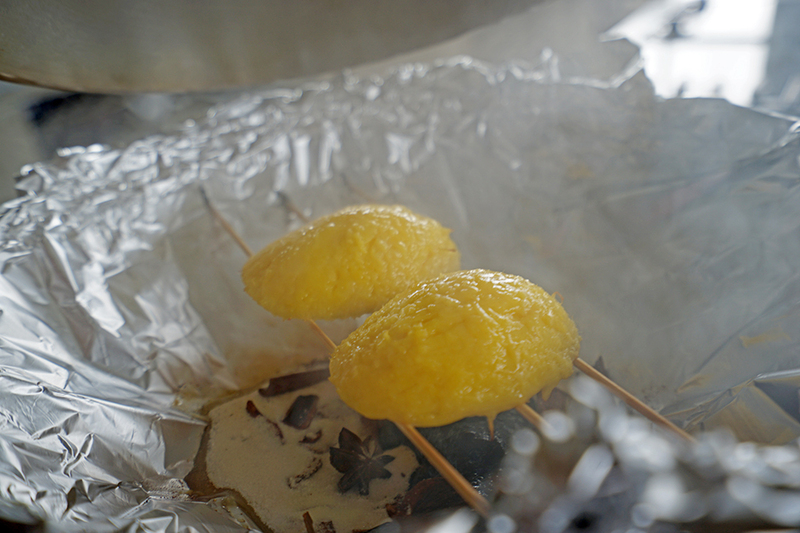 Once the sugar starts burning and smoke appears, place the two mango cheeks, flat side down on the rack. Place the remaining vanilla bean, also down on the rack, being careful to arrange it so it won’t fall in. Make sure to leave space so that there is ample circulation around the mangoes. Cover the mangoes with a tight fitting lid or aluminum foil (carefully as the pan will be very hot). Set a timer for 8 minutes and allow the wok to burn the items and smoke the mangoes. Once the timer goes off, turn the burner off and let sit for 30 more minutes, without opening the pan. Combine the mango, sugar, salt and vanilla bean in large heavy bottom saucepan and mix to combine. Place the pot on the stove on medium high heat. Stir well, making sure to mix in all the sugar so it begins to dissolve with the heat. Make sure to scrape the bottom of the pan often, to keep it from burning or sticking. Cook on medium-high heat for a total of 20 minutes, paying attention and stirring often. Turn the heat down to low and continue to cook and stir another 15-20 minutes or until the jam is to your desired thickness. The jam should be thick and jammy and not slide off your spoon easily. Once you believe the jam is near done and before testing with the plate, add the butter and stir well, cooking another 1-2 minutes. Take your plate out of the freezer to test your jam. Place a small spoonful on your cold plate and poke your finger in the jam. The jam should stay firm as opposed to running into the crevice you just made with your finger. If the jam is still runny or loose, allow it to cook again (on high heat) another 3-4 minutes and test again. Make sure you put the plate back in the freezer in between. Place the jam in a jar (or jars) and let stand uncovered to cool completely. Roll out the puff pastry, gently on a lightly dusted surface or in-between two pieces of parchment paper (my favorite method). The goal is to get the piece even thinner than its packaged version. Place one of the pieces of parchment paper on a baking sheet and then place the rolled puff pastry in the center of that baking sheet. In the very center of the pastry, place a thin layer of jam about an inch larger than the size of the brie (approximate measurements are fine). Place the brie on top of the jam that was spread and add another thick layer over the top of the brie as well as the sides. 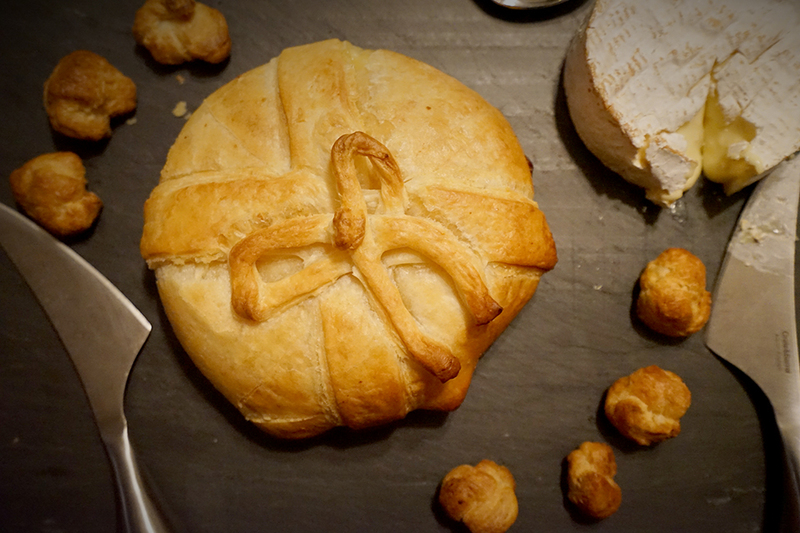 At this point we carve off any of the puff pastry that appears like it won’t be used to wrap the brie. We save this and use for decoration. Wrap the jam covered brie, forming a little package and press and seal up the edges in the center. 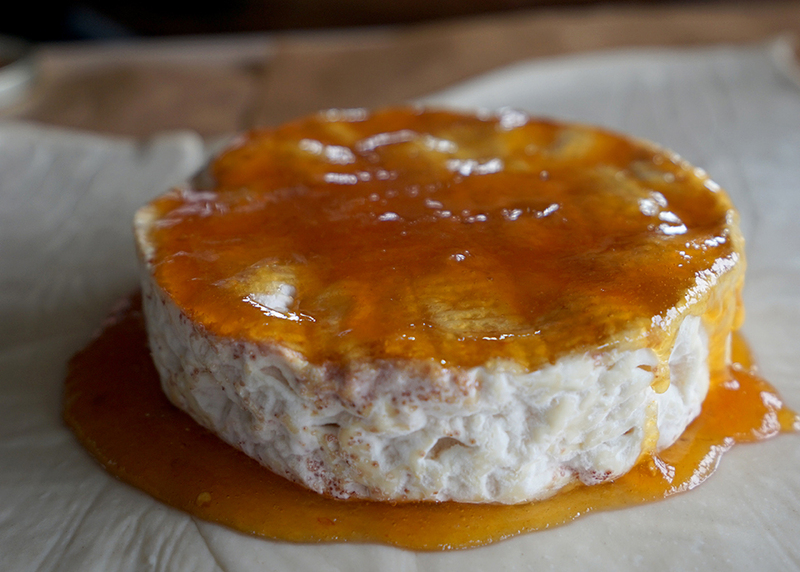 Flip over the brie, seam sides down, on the parchment paper. Decorate as desired. Brush the wrapped brie in the egg. Place the brie in the oven and bake for about 30-35 minutes, or until golden brown. Allow the cheese to firm up a bit and cool for about 15 minutes before serving.